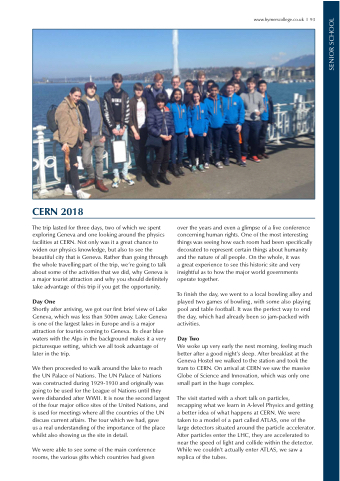 The trip lasted for three days, two of which we spent exploring Geneva and one looking around the physics facilities at CERN. Not only was it a great chance to widen our physics knowledge, but also to see the beautiful city that is Geneva. Rather than going through the whole travelling part of the trip, we’re going to talk about some of the activities that we did, why Geneva is a major tourist attraction and why you should definitely take advantage of this trip if you get the opportunity. Shortly after arriving, we got our first brief view of Lake Geneva, which was less than 500m away. Lake Geneva is one of the largest lakes in Europe and is a major attraction for tourists coming to Geneva. Its clear blue waters with the Alps in the background makes it a very picturesque setting, which we all took advantage of later in the trip. us a real understanding of the importance of the place whilst also showing us the site in detail. a great experience to see this historic site and very insightful as to how the major world governments operate together. To finish the day, we went to a local bowling alley and played two games of bowling, with some also playing pool and table football. It was the perfect way to end the day, which had already been so jam-packed with activities. We woke up very early the next morning, feeling much better after a good night’s sleep. After breakfast at the Geneva Hostel we walked to the station and took the tram to CERN. On arrival at CERN we saw the massive Globe of Science and Innovation, which was only one small part in the huge complex. The visit started with a short talk on particles, recapping what we learn in A-level Physics and getting a better idea of what happens at CERN. We were taken to a model of a part called ATLAS, one of the large detectors situated around the particle accelerator. After particles enter the LHC, they are accelerated to near the speed of light and collide within the detector. While we couldn’t actually enter ATLAS, we saw a replica of the tubes.